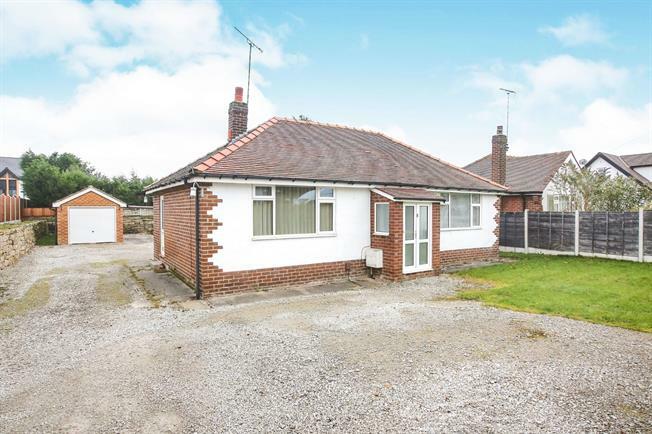 2 Bedroom Detached Bungalow For Sale in Stockport for Offers Over £425,000. This well presented two bedroom detached property sits on a large plot on one of the most desirable roads in Marple. The property offers a great deal of potential for any young family or investor looking to redevelop the plot / property to create a dream home. In brief the property comprises entrance hall, living room, kitchen diner, two double bedrooms and a bathroom with separate WC. To the first floor are two attic rooms ideal for use as occasional bedrooms. These rooms would be an ideal location to create Dorma conversions and create further living space. Double glazed window facing the rear overlooking the garden and double glazed door leading onto the garden. Wall and base units with work surface over. Space for dining table. Double glazed uPVC window facing the rear overlooking the garden. Radiator, ceiling light. Freestanding bath, electric shower, pedestal sink. Double glazed window facing the rear, under eaves storage. Double glazed window facing the rear, Velux window.